This architectural drawing of the Pantheon in Rome features intricate detail, drawings of the statues and columns with their capitals, a cut-away showing the passages inside the walls, and includes shadow to give a sense of solidity. The Pantheon was built in A.D. 126 and is still standing today. Some time in the early six hundreds it was taken over by a dark religious cult called the “Christians” and is still today used as a Roman Catholic Church. However, as the name of the building suggests, it was originally a temple meant for all the gods. 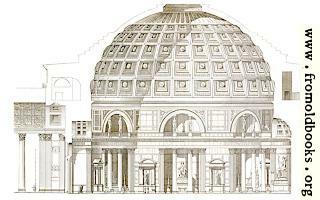 The interior is round, a diameter of over 140 feet (43 metres) and the interior height is the same. 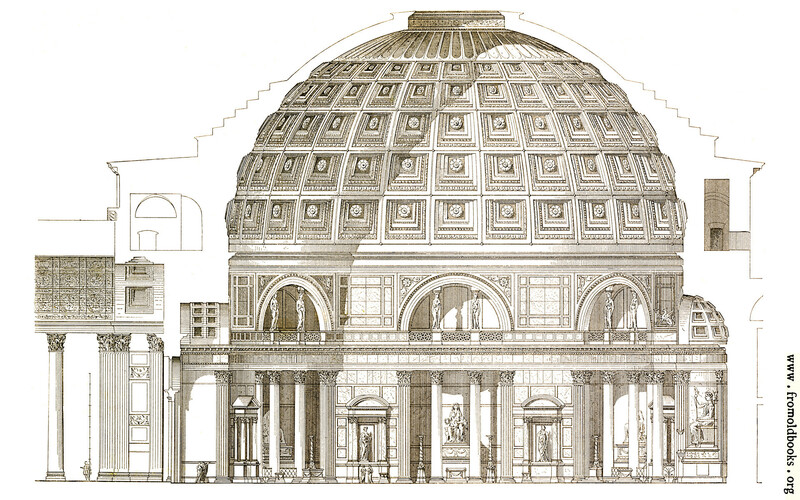 The Pantheon includes the tomb of the dead artists Raphael.